HealthWorks! offers professional development for school teachers and staff! Learning is a serious matter…or is it? Here at HealthWorks! we like to make it silly too! Teachers will explore how to teach new content, review previously taught skills, and assess formatively through game-based classroom experiences. Great for teachers of all grade levels, because here at HealthWorks! we’ve learned that kids of all ages love to play! We all know that kids learn – and behave – best when Joy is injected into the classroom! 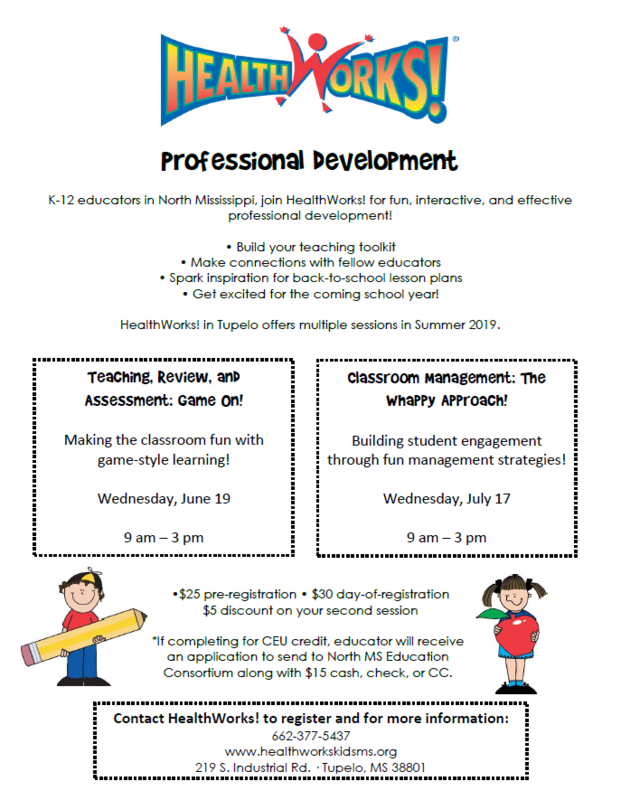 Teachers will learn about the HealthWorks! brand of fun, what we call Whappy, and how implementing it in the classroom in different ways can contribute to a joyful, well-managed, and attentive classroom experience! At the culmination of the workshop, participants will receive a form to complete and send in to the North MS Education Consortium with $15 cash, check, or debit/credit card. Kim Burleson: Kim has been a health educator at HealthWorks! for nine years, where she’s done everything from creating new programs and teaching homeschool to leading toddlers in learning and play. Before joining the HealthWorks! team, Kim taught and assisted at the First Presbyterian Church preschool and kindergarten. Lee Stratton: Lee served his entire educational career in Mississippi. He received his undergraduate degree in Math Education at Mississippi College and his Masters of Education Leadership from the University of Mississippi. Lee has many years of experience as a teacher, coach, and administrator and currently serves as a health educator at HealthWorks!. *Please bring your preferred note-taking tools (tablet, laptop, notebook/pen) and a curriculum map, long-term plan, and/or list of future skills/objectives so you can engage fully in the hands-on planning portions of the sessions. or call HealthWorks! at 662-377-5437. Want to share this with your teacher friends? Click on the flyer to print or email it. HW! can also develop a program to meet your school or district’s needs.